HAVING A SENSE of morality is one of the things that differentiates us from animals. By nature, we are sincerely concerned with what is right and what is wrong in human behavior. Unlike animals, we care about living out ethical principles. A course in Ethics is thus undoubtedly fundamental and necessary. The subject significantly helps in endorsing valuable moral and social values like cooperation, social responsibility, respect for human rights, compliance with the law, and peace preservation. As Ethics calls for rational and righteous living, it encourages making good choices and living a purposeful and meaningful life. 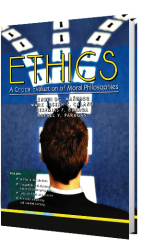 ETHICS: A Critical Evaluation of Moral Philosophies was written to serve as a comprehensive introduction to the study of morality and ethical evaluation. It humbly aims to help the readers develop a conscious ethical sense and become critical in choosing a moral philosophy to live by. Written in module form. Each lecture comes with other important elements like objectives, discussions, activities, self-tests, and others which make each module a holistic learning package. Compatible with distance/online education program. Having ample experience in teaching under distance learning program, the authors also designed this book for online students. Modular in form, the book is self-taught so students can also advance at their own pace. Online students' responses to activities, self-tests and discussions may be sent to their respective professors through e-mail. Uniquely filled with analyses. Unlike many Ethics books, its modules do not only present and explain the various moral philosophies but also critically evaluate them by deeply examining them in detail. Advocates e-learning and blended learning. When adopted by professors, many instructions under Activities will allow students to further learn from additional online lectures which were already screened and filtered by the authors. Some activities are even programmed to let the students experience engaging in intellectual discussions with other people anywhere in the world online. If used creatively, this book could also integrate the development of thinking abilities with the four language skills so crucial to success in college and careers: reading, writing, speaking, and listening. Through thought-provoking readings, writing assignments (answering questions in the 'discussions,' reaction papers, and essays), and discussion exercises, students can improve their language skills. A set of specific objectives which allows readers to anticipate the concepts, principles or skills they will learn in the module. The lecture proper which presents and discusses in details the topics. The analysis part where the critical evaluation and appraisal of the ethical theory could be read. Discussions which contain questions and guide topics professors can use during lectures, or for recitation and evaluation. These lead the students to further internalize the subject matter. Activities which provide students with means through which they can further internalize the topic or experience how the concepts can be applied. These can also serve as pre-lecture or post-lecture homework, or classroom task when the professor could not attend class. Self-tests which measure how well the students comprehend the lecture. Professors may use them for evaluation (quiz, pre-test, etc.). Professors under distance learning program may supplement this book, for instance, by providing a calendar of deadlines on which online students have to submit their responses (answers to self-test, reactions to discussions, products for activities, etc.). Ultimately, professors arc free to treat each module either as a self-contained unit or as a launch pad to other teaching-learning processes. This book is designed to help you become knowledgeable and critical about various moral theories. Hopefully, this could also help you become better in reasoning skill, a quality which you can subsequently apply to your other academic subjects and various facets of life. The lectures, moreover, call for you to provide context for the topics by eventually considering them in forming or modifying your personal beliefs and principles. To online students, you should treat this book as your personal tutor. By dedicatedly reading the lectures and faithfully accomplishing all the things required by your assigned professor, you can teach yourself the necessary knowledge and skills related to Ethics. Remember that those competencies cannot be acquired by unintelligently subscribing to 'cut-and-paste' malpractice in accomplishing your tasks and assignments. To all students, if you wish to benefit much from this Ethics book, you should be ready to dedicate as much time as necessary. Taking this book seriously will help you transform into an intellectually mature, creative, and responsible moral person. You've got to be brave and you've got to be boa Brave enough to take your chance on your own discrimination — what's right and what's wrong, what's good and what's bad. Nursing is an important field in healthcare as it is the process for caring for, or nurturing client in all health care setting. It also refers to the care carried out by any individual who has had formal edification and preparation in the art and science of nursing. To further provide satisfactory service to their patients, nurses also have to observe moral and ethical principles and practices, as ethics and morals may serve to provide dilemmas and conflicts in rendering sufficient service to patients. In addition, ethical principles and morals must be properly given importance and significance in the nursing practice to ensure that the well-being and health of the patients would be given priority, thus, upholding and promoting the moral aspect of the practice. Ethical nursing practice involves the performance of nurses' roles and responsibilities which is facilitated with integration of social justice towards the promotion of life. Nurses should endeavor as much as possible individually and as a group to advocate for and eliminate social inequities, injustice and discrimination. Today, nursing students are expected to think critically, and to utilize moral and ethical principles in carrying out their responsibilities during their related learning experiences. This book was made possible in anticipation of meeting learning needs, albeit the approach is synthesis of conceptual and theoretical highlights. Moreover, the purpose of this hook is to assist students integrate concepts of holistic nursing with the application of appropriate ethical and moral principles to all types of patients anytime in any health care setting. 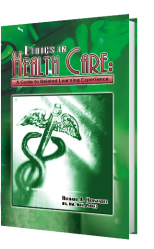 Chapter 1: Ethics and Nursing Care focuses on the discussion of morality of an act and the significance of ethics in the health care industry. Chapter 2: Approaches in Ethics highlights the factors to be considered in making decisions which are moral. Chapter 3: The Roles of Nurse Ethicist enumerates the responsibilities of nurses to their patients, physicians and among others who are connected in the promotion of the client's welfare. Chapter 4: Bioethical Principles discusses certain principles of ethics to be considered in making decision in times of conflicting issues, especially those that question the morality of an act. Chapter 5: Issues on Family Planning discusses the different methods of natural and artificial family planning. It also enumerates propositions for and against institution of family planning. Chapter 6: Issues on Abortion provides a discussion of different types of abortion and how the community at large reacts on the morality of this act. Chapter 7: Issues on Euthanasia describes the different forms of euthanasia and enumerates some of the religious objections. Chapter 8: Issues on In Vitro Fertilization describes the in vitro fertilization and discusses the morality of this act. Chapter 9: Issues on Stem-cell Research describes stem cell and enumerates propositions for and against researches on stem cells. Chapter 10: Issues on Medical Tourism focuses on the description, process and history of medical tourism and enumerates some of its legal and moral implications.